with our winter wallflower friends retreat right around the corner and *registration closing in two weeks, we thought it was a perfect time for a photo contest. and we're excited to share that the winner will receive a gift certificate from lensbaby, to select the lens of your choice. contest deadline is friday, january 14th at 5 PM (CST). winner will be announced on facebook monday, january 17th. *just a few seats remain. if interested, we encourage you to register soon. registration closes jan 21!! my friend, leah, and i have been talking about doing a workshop for years now. going back and forth... should we? shouldn't we? if we do it, we have to do it right. and we want ours to be different. truly and deeply inspiring. learning and growing... together. and then things started happening. sort of falling in our lap. and so we did. for months, we have been working to make our workshop dream a reality. 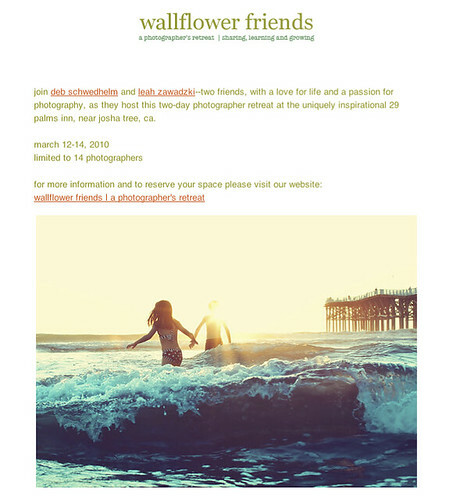 and today, we officially launched wallflower friends | a photographer's retreat. we feel so very blessed and grateful to be at this point in our photography journey and we're so excited to share! !